Buckden Towers, now a christian retreat and conference centre, was originally built as the residence of the Bishop of Lincoln and was listed as such in the Domesday Book in 1086. It is uncertain when it was first built, however most of the surviving buildings are 15th century but also include a Victorian house. The original Bishop's residence was rebuilt circa 1225 by Bishop Hugh de Wells while the great hall was built by Bishop Robert Grosseteste in 1235-54. In 1291 a fire destroyed most of these buildings of which stone foundations remain. The Great Tower was constructed by Bishop Rotherham in 1472-80 however Bishop John Russell (1480-94) was responsible for the majority of the rebuilding on the site including the inner and outer gatehouses and the enclosure walls. A new chapel was built under Bishop William Smith in 1495-1514. In the mid 17th century, a large part of the house and the great hall was demolished. The house was restored on a smaller scale by Bishop Robert Sandserson (1660-63), however the great hall wasn't rebuilt. In 1838 half of the main buildings and part of the gatehouse were demolished and in 1842 the Palace was conveyed to the Vicar of Buckden and partly converted for use as a school. The Victorian house was built on the north side of the inner courtyard in 1872 by Arthur Wellington Marshall to the designs of Robert Edis. In World War I the house was used as a convalescent hospital and in 1919, it was sold to the historian, Dr Robert Holmes Edleston, who spent much time reconstructing parts of the old Bishop's Palace. He also planned to rebuild the old chapel, but only the crypt was built and this survives as the Lady Chapel. During World War II evacuees from the London Blitz were housed at Buckden Towers which was subsequently converted for use as a hostel for agricultural workers. In 1956, it passed into the hands of the Claretian Missionaries for use as a seminary and in 1974 the St Claret Centre was opened for conferences and retreats. The Buckden Palace complex includes the Great Tower, gatehouses, foundations, and a Victorian house. The manor belonged to the Bishops of Lincoln at the time of the Domesday Survey but it is uncertain when the first house was built. Bishop Hugh de Wells is said to have rebuilt a manor house circa 1225 and Bishop Robert Grosseteste (1235-54) is credited with building the great hall. In 1291 a fire destroyed most of the buildings of which stone foundations remain. The Great Tower was constructed by Bishop Rotherham (1472-80) but Bishop John Russell (1480-94) was responsible for the majority of the rebuilding on the site including the inner and outer gatehouses and the enclosure walls. A new chapel was built under Bishop William Smith (1495-1514). Under the Commonwealth a large part of the house including the great hall was demolished, but the house was restored on a smaller scale by Bishop Robert Sandserson (1660-63), the great hall, not being rebuilt. In 1838, with the importance of the Palace diminished, half of the main buildings and part of the gatehouse were to be demolished. In 1842 the Palace was conveyed to the vicar of Buckden and part of the main building was subsequently used as an elementary school. A Victorian house, now known as Buckden Towers, was built on the north side of the inner courtyard in 1872 by Arthur Wellington Marshall to a design by Robert Edis. At the same time the moat was completely filled in. During World War I the house was used as a convalescent hospital. In 1919, it was sold to the Durham historian, Dr Robert Holmes Edleston who spent much time reconstructing parts of the old Bishop's Palace including a plan to rebuild the old chapel but only the crypt was built and this survives as the Lady Chapel between the current Church of St Hugh of Lincoln and the Claret Chapel. During World War II the Towers was home to evacuees from the London Blitz and was subsequently used a hostel for agricultural workers. In 1956, it passed into the hands of the Claretian Missionaries for use as a seminary. The Claretians took possession in 1957 and embarked on restoration work including the building of a new chapel. In 1974 the St Claret Centre was opened for conferences and spiritual retreats and in 1988 an appeal was launched to restore and develop the whole complex. The Inner Gatehouse has been converted into six fully furnished self-catering apartments and a teashop. The Tower has been converted into dormitories, a dining room and a meeting room. 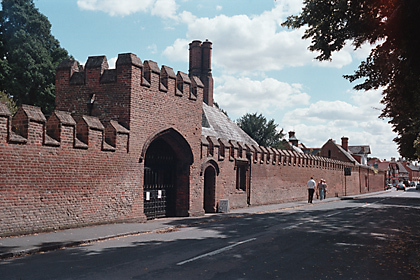 The Outer Gatehouse now houses a book and souvenir shop. Further information about monuments may be obtained by contacting NMR Enquiry and Research Services , through the English Heritage website.